Wylie Hall colt bred for the classics! 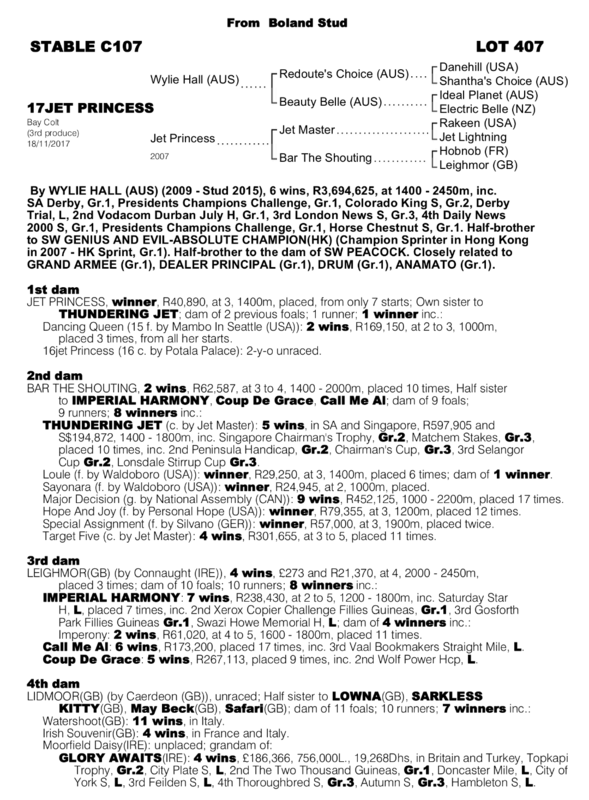 Boland Stud’s strong draft for the 2019 National Yearling Sale in April includes a colt (Lot 407) from the second crop of exciting Redoute’s Choice sire Wylie Hall. The latter, a multiple Gr.1 winning half-brother to top class sprinter Absolute Champion, made the perfect start to his stud career when his very first runner, Wily Lass, won on debut. Wylie Hall, who himself went unraced at two, also became the first of the first crop stallions represented by their first stakes winner when his promising two-year-old son Twilight Moon dead-heated for first place in the recent Listed Storm Bird Stakes. Wylie Hall, who shares his multiple champion sire with such star stallions as Snitzel, Stratum and Not A Single Doubt, was an outstanding racehorse whose six wins included both the 2015 Gr.1 President’s Champions Challenge and 2013 Gr.1 SA Derby, with Wylie Hall also finishing first past the post in the 2014 Gr.1 Vodacom Durban July. The handsome bay earned more than R3.6 million during his career, which saw Wylie Hall win from 1400-2450 metres. 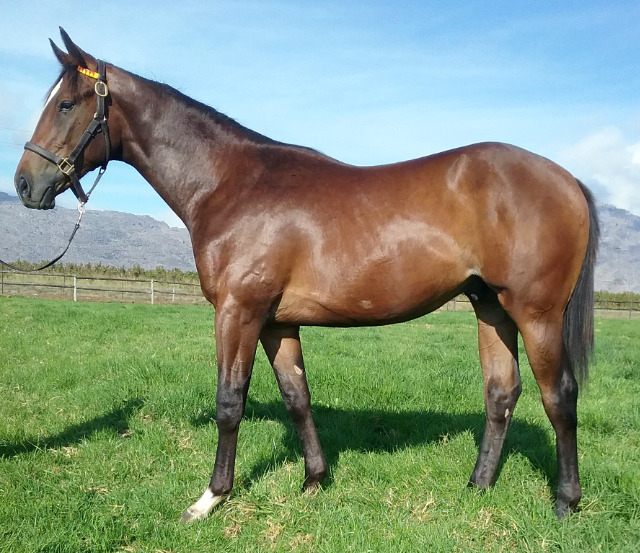 Boland Stud offer a colt by this exciting prospect, with this colt having been produced by the regally bred Jet Master mare Jet Princess. Already dam of a multiple winner in Dancing Queen with a merit rating of 92, Jet Princess is an own sister to the top class Thundering Jet, winner of the Gr.3 Matchem Stakes in South Africa and Gr.2 Chairman’s Trophy in Singapore. 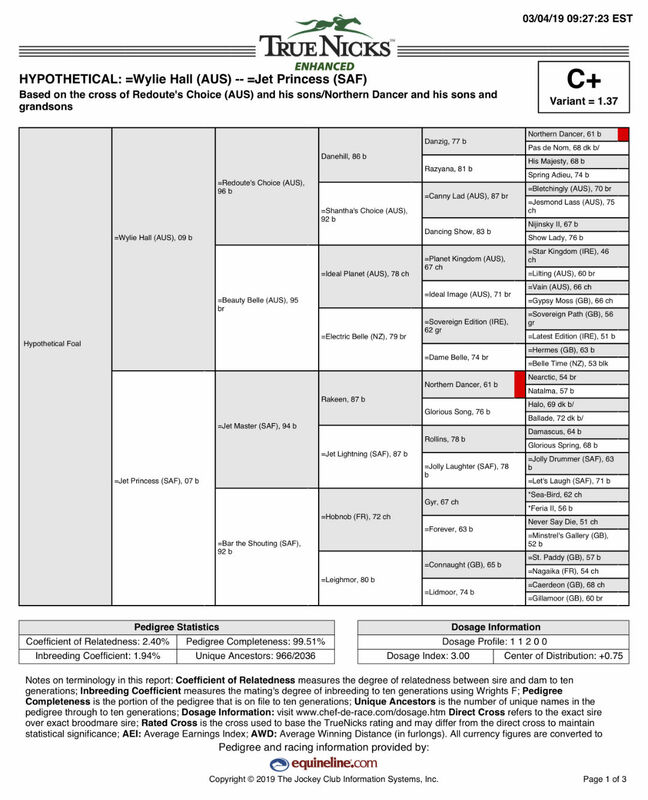 Jet Princess, whose other notable relatives include 2000 Guineas runner up Glory Awaits, is a direct descendant of Wokingham winner Kong –the dam of Epsom Derby winner Nimbus and hugely influential stallion Grey Sovereign. Other major international winners from this family include Galleon (Futurity Stakes), Raffindale (Epsom Hcp), and former South African star sprinter Sunera. Broodmare sire Jet Master is fast becoming an outstanding broodmare sire, with his daughters having already produced the Equus Champions Edict Of Nantes and Lady In Black, the Gr.1 winning half-brothers Rainbow Bridge (Sun Met) and Hawwaam (SA Classic), and Gr.1 Cape Fillies Guineas runner up Silvano’s Pride. This colt has been bred on a similar cross to the one that produced Gr.1 winners LANKAN RUPEE, LUCKYGRAY, MUSIR, SNITZERLAND, THE AUTUMN SUN, KING’S ROSE, MIGHTY BOSS, RUSSIAN REVOLUTION, MASTER OF DESIGN, BONARIA, ANAMATO, QUINTESSENTIAL, INVADER, PEEPING and WANDJINA. Boland Stud invites you to make an excursion to Ceres to view their impressive draft of yearlings for the BloodStock South Africa National Yearling Sale. From today, until Friday 12th April at a time suitable to you. To schedule your visit please contact Eugene Freeman on 084 816 3741 or email him at eugenefreeman@bolandstud.co.za Make a day or a long weekend of your trip and come and enjoy all that the beautiful Ceres valley has to offer. We look forward to the pleasure of your company. 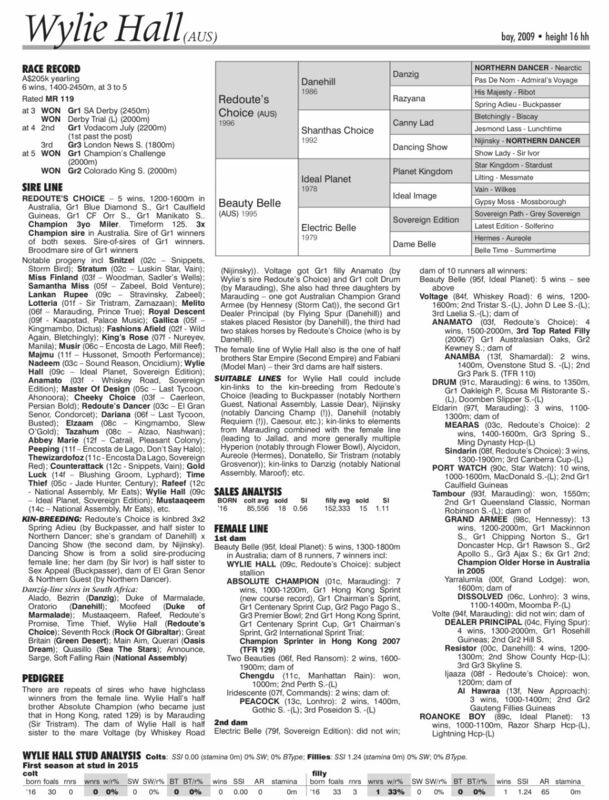 From Monday 15th April, yearlings will be at the TBA Complex in Johannesburg for viewing.